​Free 2 Day shipping in contiguous USA. Private Listings in contiguous USA typically take 2 days for shipping but may take up to 3 days. Shipping charges will apply on all international shipping. special price on NEW PRINTABLES - MATH FLASH CARDS! yes!!! my family needs this! ​Our entire website is full of detailed information about customizable chore charts for kids, multiple child chore charts, chore chart ideas, age appropriate chores for kids, what motivates kids to do chores and how to create your own system that really works! Please click around and you will find just about everything and anything you wanted to know about chores. It is also loaded with free printables and new ones are added regularly. You can sign up for our newsletter which is found at the bottom of this page to receive news, special offers, freebies and keep up to date on everything NEATLINGS! ~ Thanks for visiting, your welcome back anytime! 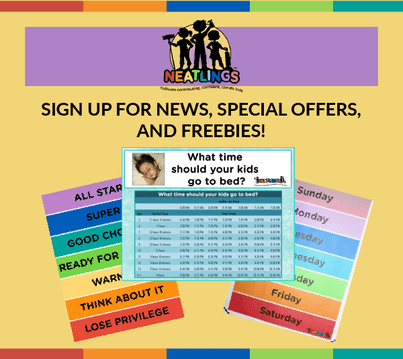 Do you want freebies, special offers, and to be kept up to date on everything NEATLINGS? Sign up here!